The fastest growing companies in the money transfer space, such as Revolut and TransferWise, have highly viral products. Quite simply, their customers are their marketing engine – and a very powerful one at that. For everyone else, having a viral product is something to aspire to. The accepted industry standard for measuring product virility is called a Net Promotor Score (NPS). We have started collecting our own data on NPS, providing for the first time a consistent method to track and benchmark NPS for the industry. Look familiar? That’s an NPS scale. NPS was designed as a benchmark score for customer satisfaction. It categorises your users into promoters or detractors, and scores can range from -100 (all detractors) to 100 (all promoters). It’s purpose is to gauge how likely your customers are to recommend your brand, which as any marketing team knows is crucial for growth. However, once you know your own score, a question arises – how does it compare to my competitors? Collecting your own NPS score can help you frame and track your customer satisfaction internally. What it can’t do is tell you how your score compares to your competitors. For instance, does a score of 50 put you in the top or bottom 25% of your competitive set? 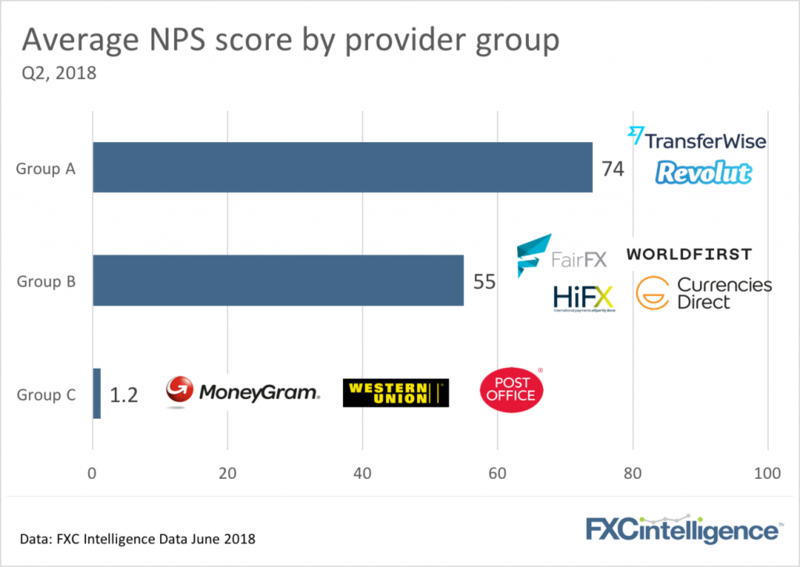 That’s the problem we set out to solve with the money transfer industry’s first NPS benchmark index. We surveyed over 130,000 individuals in the UK to collect NPS scores for a range of leading payment providers. Here’s a sample of our results, grouped by provider type: There are a range of scores within any one group, but it’s not suprising that many of the newest providers (who have put an emphasis on usability, referral marketing and of course very low cost) are leading the industry.